Instagram today said it has introduced three new features that are meant to help keep its one billion users safe. To start, a new "about this account" section will appear so people can see when other public accounts were created, where it is located, if the screen name has been changed, and what ad campaigns the account might be running. This is reserved for accounts with large numbers of followers. Second, Instagram is making it easier for people to verify their accounts. Those who wish to verify their account can follow the steps in the settings menu. Instagram says not everyone who applies for account verification will receive it. Verified accounts will feature a blue checkmark, signifying the account is genuine. Last, Instagram plans to soon add support for third-party authenticator apps. This allows people to add an extra layer of security. For example, a user could choose to rely on 1Password rather than SMS as part of a two-factor login. Instagram says the first two tools are rolling out now and third-party authenticator support will arrive soon. 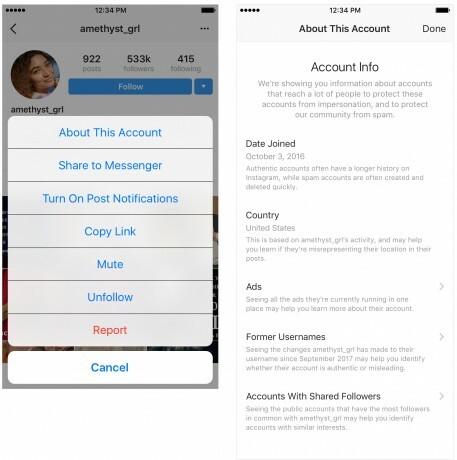 Instagram today said it is taking steps to reduce what it calls "inauthentic activity" across the social network. The company says more accounts have begun to use third-party apps to boost their follower numbers and inflate like counts. Google has made it easier for people to setup and use two-step verification to protect their accounts. Google already allowed users to tap a Security Key or enter a verification code sent to their phone.